Bodily Injury Protection Requirements in NY - How Much Do You Need? New York is a no-fault insurance state. Under the state’s No Fault Law, motorists are required to carry liability coverage, and insurance companies are required to provide coverage for injuries that are sustained as the result of a motor vehicle accident, no matter who was at fault. Of all the things that liability coverage offers, bodily injury coverage is one of the most important. Not only are drivers required to possess liability insurance that offers these limits, but the insurance (and the bodily injury limits) must remain effective for as long as the vehicle’s registration remains valid. This is true whether or not you are using your vehicle. Furthermore, liability insurance must be issued by an insurance company that operates in the State of New York or that is licensed to provide coverage within the state. And, the insurance has to be issued to whomever the vehicle is registered to. It also has to remain in that person’s name. What Is Covered Under Bodily Injury Protection? What does bodily injury protection cover? It assists with any medical costs that are the direct result of a car accident. What is the Structure of Bodily Injury Protection? Limits for bodily injury protection are usually illustrated in two specific dollar amounts: $50,000 and $100,000. These two amounts are displayed next to each other on a policy. The first amount, $50,000, illustrates the coverage limits for damages that are experienced if only one individual is injured in an accident. In other words, liability protection will only cover up to $50,000. If, however, injuries exceed $50,000, the person responsible for the accident would be required to pay the for the difference. The second amount, $100,000, illustrates the coverage limits is more than one individual is injured in an accident. For example, if two people are injured in an accident, personal injury protection will offer coverage in the amount of up to $100,000. Should the cost of damages for more than one person exceed this amount, the person responsible for the accident would be required to cover the difference. 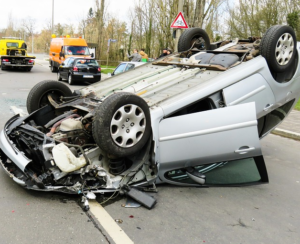 Should You Purchase Additional Bodily Injury Protection Coverage? As mentioned, in New York, the minimum coverage requirement for bodily injury coverage is $50,000 for a single person and $100,000 for two or more people. While this amount may be enough to cover the cost of damages that are associated with an accident, there is a good chance that it will not be. Medical fees can be quite expensive – especially in New York – which means that the cost could quickly add up. Furthermore, many areas in New York have high-traffic roadways and driving conditions can become quite treacherous; two factors that can increase the chances of an accident occurring. While you will be required to cover the minimum amount of $50,000 and $100,000 for bodily injury respectively, purchasing additional protection could be a very worthwhile investment. It may be able to help protect you from serious financial losses in the event that you are deemed legally responsible for covering the cost of any damages that exceed the minimum requirements. How Much Does Bodily Injury Protection Cost? The cost of bodily injury protection is fixed into your liability coverage. The cost of liability coverage will vary from person to person. Multiple factors, including age, driving record, the type of car you drive, and where you live in New York will impact the price of your coverage. If you want to get a quote for bodily injury protection, please give your insurance agent a call. He/she will be able to give you the run-down in terms of what coverage you need and how adding this type of coverage will impact your premiums.